Buy One Get One at 50% for sandwiches and salads, not available with other offers. Available Monday through Saturday 11-3. Get the best of summer at Prairie Kitchen and Bar in Hyatt Regency Minneapolis! Any guest that comes in with their Aquatennial Pin will receive 20% off their bill (excluding alcoholic drinks). Happy Hour 3pm to 6pm every day! Buy one beverage, get one free. What’s better than a refreshing Fulton beverage to celebrate Aquatennial with? How about two? Present your 2018 Skipper pin for a special Aquatennial BOGO deal in the Fulton Taproom. Buy one get one on any donut. BOGO on The Local’s signature cocktail: Big and Skinny gingers. $10 off a $30 purchase for lunches 11am – 3pm. Receive two drop-in classes for the price of one. Receive one free True Hue signature candle with $100 or more purchase from Roe Wolfe. 1 free week of unlimited yoga at any participating CorePower Yoga studio, for new students only. BOGO brews at the taproom. $10 off $40 purchase. Not valid with any other offers or discounts. Valid July 1-20. Click Here to download the Skipper Pins promotions guide in PDF form. ** 2018 Aquatennial Skipper Pin must be present to receive promotion. All offers valid July 1-July 21 unless otherwise noted. Exceptions/Restrictions may apply on some specials. Check with establishment for details. 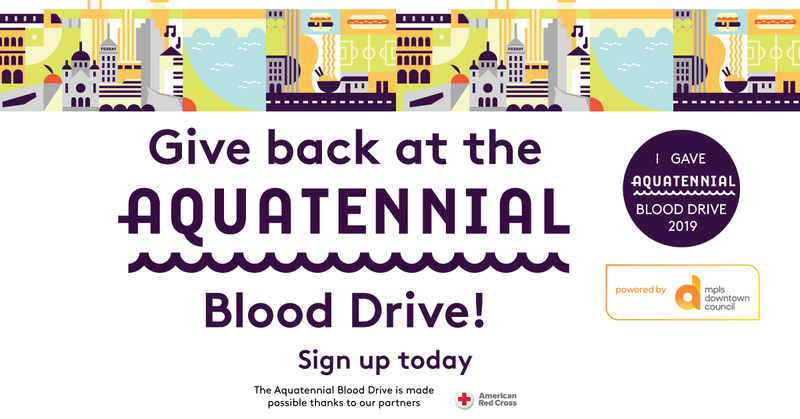 Save a life at Aquatennial—Give Blood! Blood donations are in great need, and you can help save a life by giving blood with the American Red Cross at the Minneapolis Aquatennial. Our blood drive will take place Wednesday, July 24 (9 am-3 pm), Thursday, July 25 (9 am-2 pm) and Friday, July 26 (9 am-3 pm) at IDS Center Crystal Court. Check back soon for online registration sign-up opportunities to secure your timeslot. Plus, your team can take part of our company challenge. The company that signs up the most participants for the Aquatennial Blood Drive will win 20 passes for the Target Fireworks VIP viewing area on Saturday, July 27 at 10 pm along West River Parkway near the Stone Arch Bridge! Get your run on and enjoy a post-race party along the Mississippi Riverfront! Whether you are a dedicated runner or just someone who jogs from the couch to the fridge, the Life Time Torchlight 5k is the fun run for everyone! The Life Time Torchlight 5k runs through downtown and ends with a legendary post-race party featuring musical entertainment and refreshments. For more information on the Life Time Torchlight 5k or to register, CLICK HERE. Each year the Aquatennial continues to thrive thanks to the hundreds of individuals that help out through the Aquatennial Volunteer Program Sponsored by U.S. Bank. This year, you can be part of all the fun! Don’t miss out on being part of the Aquatennial Volunteer Program sponsored by U.S. Bank! Ask us about volunteer opportunities by sending us an inquiry (using the subject Volunteer Inquiry) and take part in events like the CenterPoint Energy Torchlight Parade, Target Fireworks and more. This annual program offers a chance for individuals or corporate groups to have fun while giving back to your community during Minneapolis’ Official Civic Celebration. Perks include access to the premier viewing area at the Target Fireworks on Saturday, July 27, a t-shirt and more. The earlier you sign up, the more volunteer times and locations will be available for your team. For more information, email coordinator@mplsdowntown.com.